Alpha particles ( a ) are relatively slow and heavy. Alpha particles can not penetrate your skin. Due to the low penetrating power of Alpha particles, they are generally not a cause for concern, unless you ingest some material that emits Alpha radiation. For the most part, materials that emit Alpha particles, also emit some Beta or Gamma radiation. Beta particles ( b ) are fast, and light. Beta particles have a medium penetrating power - they are stopped by a thin sheet of aluminum (such as aluminum foil) or plastic. Beta particles can penetrate deeply into your skin. Gamma rays ( g ) have a high penetrating power - it takes a thick sheet of metal such as lead, or concrete to reduce them significantly. Gamma rays penetrate your skin, and continue on... going right through your body. The emission of radiation from radioactive materials is constant. the rate of natural radioactive decay from radioactive materials will remain the same. This is why materials of this type are used in Atomic Clocks and for determining the age of ancient artifacts. The radiation emitted by Uranium ore is generally low & the samples are safe to handle. Some ores emit substantially more radiation than others (Pitchblende for example), but the samples are still safe to handle & inspect. Even though the radiation produced by these samples is reasonably low, continuous exposure to the higher level samples is certainly not recommended. Radiation damage is cumulative, and although picking up a high level sample to inspect it is no cause for concern, keeping a chunk in your pocket or under your pillow - and sleeping with it night after night is something you should avoid. Small radioactive chips, crystals or powder can potentially flake off of your sample so it's always a good idea to wash your hands after handling any radioactive ore sample - and certainly do not eat or drink when you're handling a sample. Ingesting radioactive material is something we recommended you avoid no matter how good it may taste to you. As with many things, a little common sense goes a long way, and with a couple simple precautions, these materials are quite safe to deal with. 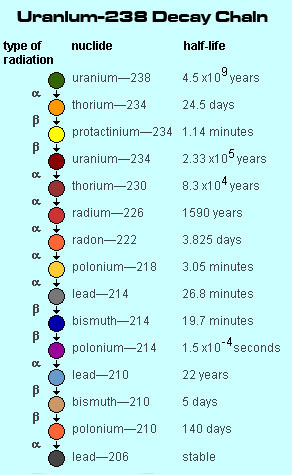 The ~gigantic~ quantity of deep underground Uranium ore found around Uranium mines & deposits produces Radon gas and many other radioactive elements as part of its natural decay process (see chart below). Radon is a heavy, odorless, invisible, radioactive gas. Having several small Uranium samples in a room isn't a cause for concern, but collections that consist of tens or hundreds of pounds of ore need to be aware of potential Radon levels. Take a hundred pounds of Uranium ore, put it in a room, and in a few days Radon levels can become a very serious concern. As Radon gas decays, it transmutes into a radioactive metal, Polonium which has a habit of sticking to small airborne dust particles. If you own giant piles of radioactive ore, it's best kept outside. If you must store it inside, invest in a Radon Detector. It will continuously display the Radon levels and should they ever rise too high, an alarm goes off. It's a worthwhile investment for the serious Uranium Ore collector. Once again, several Uranium ore samples - even a shoebox full - is no cause for Radon concern and is safe to store indoors. Keep in mind that if you go exploring abandon Uranium mines, there is a substantial amount of Radon gas waiting in there for you. Radon is a very heavy gas that sinks to the lowest level quickly. Functioning Uranium mines have giant ventilation systems that replace the air several times an hour. Abandon Uranium mines have tremendous amounts of Radon gas in them that has displaced the air due to its weight. This stagnant, almost pure Radon Gas can be at 100,000 times normal levels. You can't simply stick a mask on your face and filter out Radon, so don't bother. To safely explore Uranium mines you need a self-contained breathing apparatus. Just stay safe and don't go into any abandon Uranium mines... there's plenty of samples to collect in the tailings piles outside of the mine to keep you busy. Or even better yet, let us take the risk and simply purchase a sample from us.